The Armenian Genocide Monument, Dzidzernagapert, was constructed in 1965 to commemorate the 50th anniversary of the Armenian Genocide. Twelve imposing pylons representing the twelve provinces where Armenians were massacred surround the eternal memorial flame inside the fortress. The flame burns to represent the Armenian spirit, which can never be extinguished. The monument, which means "Citadel of Swallows", is named for a bird that always returns to its nest, even if its home has been destroyed. A unique portion of the monument is the tall, needle-shaped shaft beside it, which represents the rebirth of the Armenian people. A massive outburst of Armenian emotion inspired the building of the memorial. The location of the monument creates a powerful feeling of sadness and solitude. People from all parts of the world visit the monument to express their respect to all those who perished. The Armenians have struggled for their freedom and faith for centuries. Tragic and heroic pages in the history of Armenian people have always been closely intertwined with each other. And the same is with the events of 1915. We always remember the Armenian Genocide and the heroic battle of Musaler together. The monument symbolizing the victory of Armenians in the battle of Musaler stands on the right side of the highway to Etchmiadzin, the religious center of all Armenians. The memorial is an imposing building in orange color with moderate and severe style. It also presents itself as the museum of the battle which is the symbol of the events that took place during the Armenian Genocide of 1915 when the Armenians had to leave their homes and lands being sentenced to deportation by the command of the Ottoman Empire. Bikfaya is home to a commemorative plaque and monumental sculpture, honoring the victims of the 1915 Armenian Genocide. Designed by Zaven Khedeshian and renovated by Hovsep Khacherian in 1993, the outdoor, freestanding sculpture rests on top of a hill that is located on the grounds of the summer retreat of the Catholicate of Cilicia. 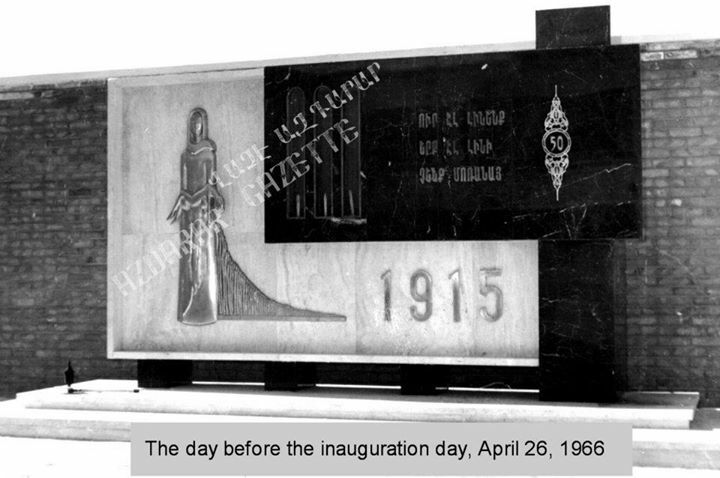 This monument, commemorating the 50th anniversary of the Armenian genocide, was erected with the cooperation of the whole Armenian Community in Lebanon, to celebrate the rebirth of the Armenian nation and to express gratitude to our country, Lebanon - April 24 1969. The Armenian community of Lebanon visits the monument every year on April 24. The pilgrimages are alternated with the memorial chapel at the Armenian Catholicossate in Antelias. Subject: The victims of the 1915 Armenian Genocide. 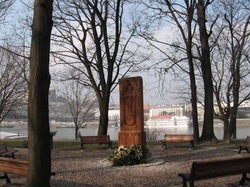 Placement: Freestanding, large monument composed of a sculpture and inscriptions. It is attached to the wall in the courtyard of Forty Martyrs Church. "In memory of 1915 Armenian Genocide" (Translated to Armenian and Arabic). There use to be a large Armenian community in Abadan, Iran and The Armenian school had 700 students, but now there is only one family left. The Genocide Memorial is next to the church and both are in the yard of the school. Church was damaged during Iran Iraq war so after the war, the Church and the Genocide monument was renovated. The Armenian Genocide Monument in Nicosia, Cyprus, is a monument dedicated to the martyrs and the survivors of the Armenian Genocide of 1915-1923. 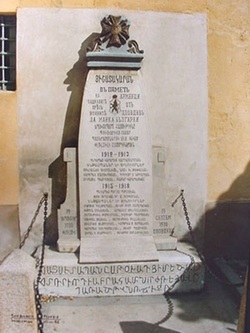 It is located within the Armenian complex on Armenia street in Acropolis, Strovolos, which contains the Armenian Prelature building, the Sourp Asdvadzadzin cathedral, the Nareg Armenian School, the marble khachkar, the bust of Archbishop Zareh Aznavorian and the statue of Gregory of Nareg. In 1989, the Armenian Prelature selected this out of two designs submitted by well-known painter and architect, John Guevherian, and construction started in early 1990. It features three marble arches, representing Armenia. Advocates from around the world joined with Romanian Armenian community leaders, AGBU representatives, and local public officials for the unveiling of the Armenian Genocide Memorial Khachkar in Pitesti, Romania, the Armenian National Committee of Romania reports. Joining in the solemn occasion were Datev Bishop Hagopian, Archbishop of the Armenian Church in Romania, and Vahram Baghdasaryan, Member of Parliament of the Republic of Armenia. Later the group visited Pitesti’s Soorp Garabed Armenian Church, which dates back to 1852. The unveiling of the Genocide memorial was timed with the opening of the International Symposium titled “World War I and its influence on the formation of the Armenian Diaspora,” held in Bucharest from September 26 to 28. The Armenian Heritage Park is a memorial park dedicated to the victims of the Armenian Genocide located on Parcel 13 of the Rose Kennedy Greenway between Faneuil Hall and Christopher Columbus Park in Boston, Massachusetts. The memorial includes a sculpture surrounded by a reflecting pool. The sculpture has 24-26 different configurations, which symbolize the dispersion and coming together of immigrants from different shores. The other part of it is a grass labyrinth that not only pays tribute to the Armenian contribution to the United States, but also represents the journey of life. The Armenian Heritage Foundation, composed of dozens of Armenian-American religious, cultural, and other organizations from around Massachusetts, raised from $5 million to $6 million for the park. The groundbreaking ceremony on May 22, 2012 was attended by Governor Deval Patrick, His Holiness Karekin II, Catholicos of All Armenians, Registrar of Motor Vehicles Rachel Kaprielian, Sheriff of Middlesex County Peter Koutoujian, Boston Mayor Thomas Menino and many Armenian-American citizens and City and Commonwealth officials. Governor Patrick said that the park will be a "beautiful addition to the Greenway as well as a testament to the heritage of Armenian-Americans and Massachusetts' larger immigrant history". Mayor Menino also noted that the park "celebrates the distinctive history of the City of Boston and the generations of immigrants who have made Boston the wonderfully diverse community it is today". Memorial stone dedicated to those who lost their lives in the Armenian Genocide of 1915. Located at St. Mark Armenian Church on Wilbraham Road, Springfield, Massachusetts. The Khatchkar (stone cross) in front of the Soorp Asdvadzadzin Armenian Church in Whitinsville, Massachusetts was erected in Honor of Elizabeth Altoonian by her children and commemorates the 1.5 million martyrs who died in the Armenian Genocide of 1915-1923. The monument was sculpted in Armenia and dedicated by His Eminence Archbishop Oshagan Choloyan on August 19, 2001. This monument is located in Providence's North Burial Ground. Sealed inside it is the skull of an unidentified 12 year old boy, found in the Der-el-Zor desert.Rhode Island has a sizable Armenian community. 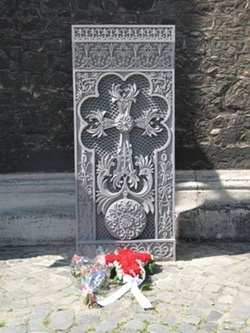 The memorial khachkar (cross stone) to the 1.5 million victims of the 1915 Armenian Genocide by Turkey. It's only a small grave, a rectangle of cheap concrete marking it out, blessed by a flourish of wild yellow lilies. who died of cholera and starvation as the Turkish authorities tried to "Turkify" them in a converted Catholic college high above Beirut. Catholicosate of Cilicia in Antelias - Lebanon. Memorial for the Martyrs of the 1915 Genocide in the courtyard of the Catholicosate of Cilicia in Antelias, Lebanon. The Martyrs’ Chapel was built when the remains of one-and-a-half million victims were brought from the desert of Der Zor to Antelias. A monument dedicated to the martyrs and survivors of the Armenian Genocide of 1915-1923. It is located at Larnaca’s seafront and marks the spot where thousands of Armenian refugees fleeing the atrocities of the Genocide first landed in Cyprus (at Larnaca Port). Its position is adjacent to the entrance to Larnaca’s present-day marina. Armenian Genocide Monument in Taksim Square, Istanbul, Turkey - From 1919 until 1922. 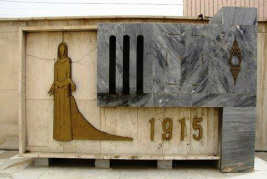 The Memorial to the 1.5 million Armenians in 1915 in the Armenian Genocide, seen outside the Church of the 40 Martyrs in Deir El-Zor, Syria. 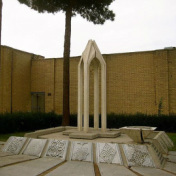 Armenian Genocide memorial in the courtyard of the Vank Cathedral in the New Julfa district of Isfahan, Iran. In Memory of the victims of the 1915 Armenian Genocide. “In the memory of the Armenian victims of the genocide perpetrated by the Ottoman authorities of 1915." In the Churchyard of Holy Nazareth Armenian Church. Inscription: Our Glorious Martyrs In grateful tribute to over one million martyrs of the Armenian Nation who lost their lives under most tragic conditions during the Great World War 1914-1918 This monument is erected by their compatriots in Calcutta on 24th April 1965 in commemoration of the fiftieth anniversary of the great national tragedy. On 23rd April 1996, a large crowd was present at the official inauguration ceremony and the Church service consecrating this monument. As tradition warrants, Khatchkar is a hand chiseled sculpture in Armenian tufa stone and weighs two tones. It was generously donated by the Sukiasyan family who are residents of Armenia. In accordance with the decision taken by the Armenian community’s legislative and executive bodies of Dubai and the Northern Emirates, the Khatchkar was named “Abrilian Nahadagats Houshagotogh” (Aprilian Martyrs’ Monument). Ever since its consecration, every year the commemoration of the Armenian Genocide at the St. Gregory the Illuminator Armenian Church begins with the lighting of candles and the placement of a wreath at the base of the Abrilian Nahadagats Houshagotogh. The Marseille Memorial is a steel obelisk commemorating the deaths of 1.5 million Armenians in Ottoman Empire during the Armenian Genocide in 1915. The monument was dedicated in 1973. Architect/Designer/Artist: David Babayan - Yerevantsi. In the middle of a square in the heart of Paris. Located near the Armenian Apost. Inscription: Until the genocide of 1915, the Reverend Father Komitas collected the songs of oral tradition of the Armenian people. In the memory of the voluntary engaged Armenian fighters and resistant’s who died for France (translated from French). In homage to Komitas: composer, musicologist and to the 1.5 million victims of the Armenian Genocide, committed in the Ottoman Empire in 1915 (translated from French and Armenian). In 2010 was erected the first monument commemorating the Armenian genocide. 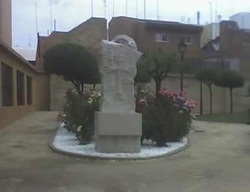 The sculpture, three meters high, is in the gardens of the Garden of Sendra, in the old town. October 2013—The Canadian-Armenian community gathered on Sunday for the unveiling ceremony of an Armenian Genocide monument here, the third largest city in Quebec and the first Armenian Genocide monument in Canada. “Khatchkar” monument in memory of 1.5 million martyrs of the Armenian Genocide. Armenian Genocide Memorial in Australia for the victims of the 1915 Armenian Genocide. The Memorial was fully renovated in 2003 by the Armenian Apostolic Church of Holy Resurrection. Inscription: This Alter-Memorial in sacred memory of the Armenian martyrs of the 1915 Holocaust was erected under the patronage of His Holiness Vazken I, Catholicos of all Armenians and blessed by Bishop Aghan Baliozian, Primate of the Australian Diocese, constructed by The Armenian Near East Society in conjunction with the Armenian Church in Sydney. April 1989. Peace in Cardiff, Wales, dedicated to the victims of the Armenian Genocide that took place in Ottoman Empire carried out by the Turkish government against the Armenian population from 1915 to 1922. The memorial was erected and unveiled on November 2, 2007 at an initiative of Wales-Armenian Society. The opening of the monument was consecrated in a service conducted by Bishop Nathan Hovhannisian, Primate of the Armenian Apostolic Church of Great Britain. His Grace David Yeoman the Assistant Bishop of Llandaff, and Dr Vahe Gabrielyan, Armenian Ambassador to the UK. 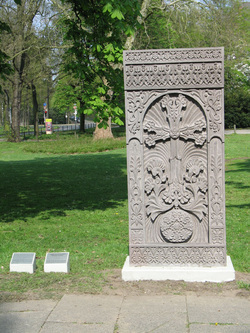 Armenian Genocide Memorial Khatchkar (Cross-stone) in Assen, The Netherlands. Owned by the Armenian Apostolic Church. Placement: Memorial wall with relief and inscriptions. Physical Setting: Flat land; located in a square along Tiradentes Avenue in central Sao Paulo. Inscription: “Even if my feet will be chained My hands tied My mouth covered My heart will shout for liberty” (Translation from Portuguese of Armenian poetry by Mikayel Nalbandian).